While the majority of people only use their e-readers to enjoy the latest bestsellers, some people also know that ereaders are a great tool to learn a foreign language. We will discuss a few tricks on how to use a Kindle for learning a new language in an entertaining way. Every Kindle has a built-in English dictionary installed and, depending on where you buy the device, also a dictionary for that language. If you try to read a book in another language you may get frustrated unless you are completely bilingual. It is not easy, and you need to have a dictionary at hand to understand the words you don’t know. If you are a beginner learner you may have to use the dictionary quite often. Thanks to the built-in dictionary installed on the Kindle you can just long-tap (tap and hold) a word and you’ll see its definition on the screen. You will not need to have a hardcover dictionary next to you anymore, just read on the Kindle and look up the definitions of unknown words with one touch. Many people write down foreign words to remember what they mean. The Kindle allows you to add a note to the selected word – so that you always know what the word means. The notes and highlights are saved in a .txt file called MyClippings.txt, so you can save Kindle notes to your computer as well. Kindle is Amazon, and Amazon has almost everything one can wish for. The Kindle store has a lot of great learning material for foreign languages. 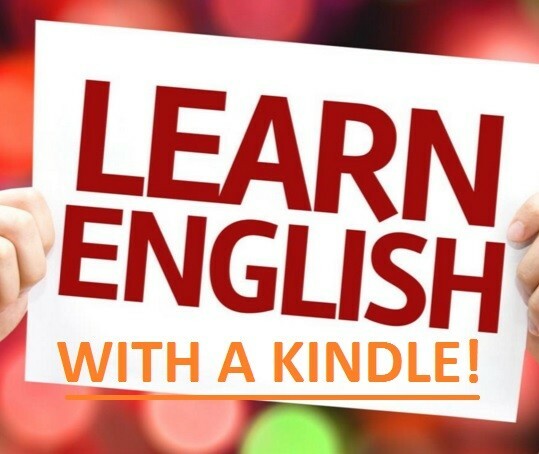 You may even be able even find titles that you may have used in the past to learn English – right in the Kindle store. Just type “learn English” and you will see a huge collection of all sorts of learning materials. World cards also have their version for e-readers. They are easy to use: every word takes up a page on the Kindle; press forward and back to explore the different words as if they were on paper. Many classics are available for free for the Kindle. If you don’t know what book you want, you can choose one of the subcategories on Amazon ebook store, specify that you want a book in English and choose a book from the selection. Do you have any other tips for learning a foreign language using a Kindle or another ereader? Please share.